With gratitude and appreciation to Linda at LiteBeing for the invitation to participate in this 2014 end-of-year ritual. As part of this blog ritual, Linda invited us to reflect on our experiences during and the gifts of this past year using these five questions (why not join in and journal them yourself? ), and then share our responses via the blog-o-sphere. Linda: Which lessons did you learn? Jamie: Two biggies include additional clarity about certain long-ago-conditioned patterns and the ability, in seeing them, to begin a sort of disentangling and non-cooperation with them. That big pattern-reveal really started in the few years leading up to, and then through, an extended Chiron Return (thank you, retrogrades!). Another lesson taken to new depths in the last year was around a greater and healthier degree of what I’ll call ‘self containment’. The ancients called this sovereignty or virgin, to be whole unto one’s self. 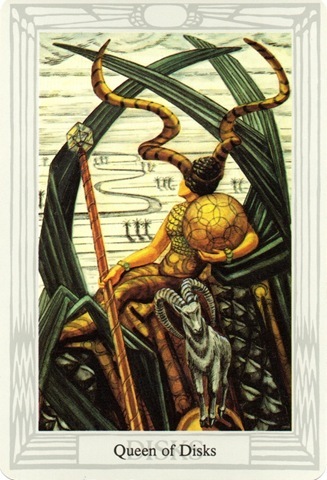 The Priestess, by Lady Frieda Harris for the Crowley-Thoth Tarot. One element, maybe the element, is learning to be much more discerning about where my energy and focus goes, what I share with others (and with whom I share certain things) and what I keep close and incubate. With attention goes energy, so part of this is becoming aware of those ingrained energy siphons and leaks that we’ve been conditioned to see as ‘normal’, and making more conscious choices about gathering my energy back or intentionally giving it to what has heart, joy, and meaning. This isn’t something I’ve mastered, by far, but progress made this last year? Yes. And I’ll be practicing on this one in the coming year and beyond. It’s an ongoing project! And I learned about ‘wild abundance‘ or ‘wild bounty’ – see more in the how did you serve answer, about the ‘wild plant allies’. Linda: How did you serve others? Jamie: Often, it seems to me, in very simple, humble, quiet ways — those random acts of kindness, listening (often to perfect strangers), cleaning up (the proverbial sweeping of the hearth and washing many, many rice bowls), more freely letting inspiration pour through me into my writings and client work, tending my beloved felines and a neighborhood feral as well, becoming more devoted to the practice and super-power-magic of blessing and being a Believing Mirror rather than the opposite. Those kind of Virgo-Vesta Mysteries of everyday acts of services that often go unnoticed but are important; they add up and can have an alchemical, if not necessarily recognized, positive or healing effect. There’s something just … satisfying about those little yet not-so-little things. 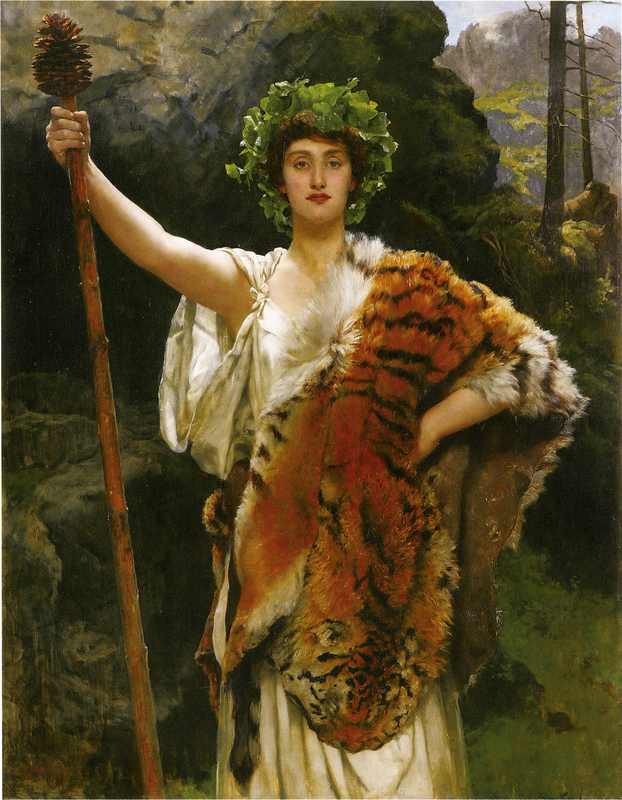 Hearth-tending, like the Vestal Priestesses of old, and our ancestor-women. 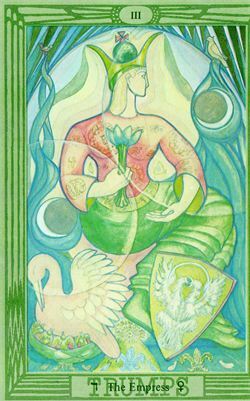 The Empress, painted by Lady Frieda Harris for the Crowley-Thoth Tarot. But also there was an Earth-serving component, not just in doing the ‘reuse, repurpose, recycle’ and that sort of thing, but in learning much more about the wild plant allies and doing spontaneous blessings for the spirits of place, this place where I dwell. This is very much a deepening of the Wise Woman Way. That was so amazingly awe-inspiring! For the first time since I was a wee girl, when I just knew these things, I really had a sense of the wild abundance we’re surrounded by — gifts from Mother Earth — and I was in awe … and it was really fun. Linda: What blessings did you receive? Jamie: The things I’ve just mentioned are blessings, to be sure. Plus, the friendship of my anam cara is such a blessing — our ongoing conversations and believing mirror practice. I can say that’s been a lesson, too, about believing mirrors and diminishing mirrors and taking much more care about which I wanted to be, because I know just how deflating and disheartening it can be to be surrounded by diminishing mirrors who seem to find glee in … well … diminishing others! Plus, ongoing conversations with friends at a distance, thanks to technology (and occasional, telepathy!). Inspiration from fellow bloggers and walkers of The Way. The blessings from the wild plant allies. Much more time with my niece and god-daughter. 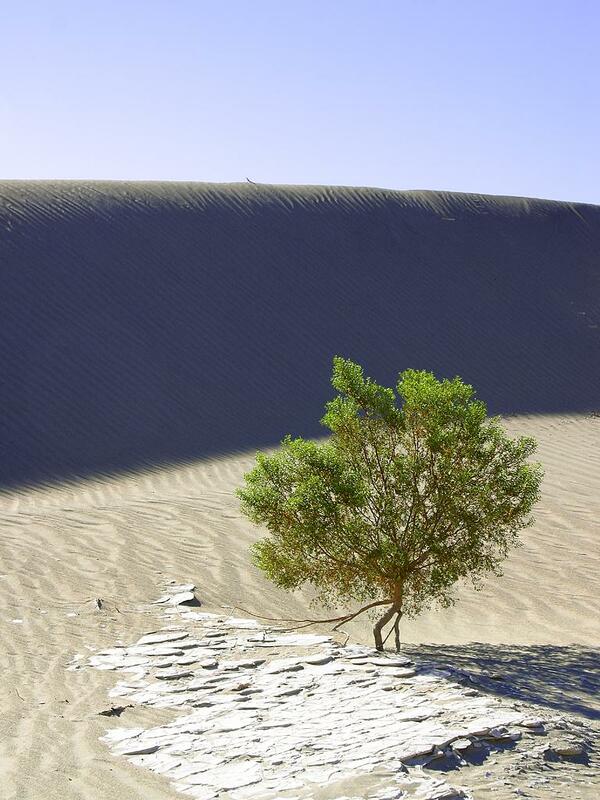 There are so many, really; despite some stiff challenges, blessings were plentiful, too. Linda: Was there something you lost that turned out to be a blessing in disguise? Jamie: Well, honestly, 2012-2013 completed 7 and 9 year cycle, and a larger Jupiter cycle as well. A lot of deconstruction (aka Pluto as ring leader) in that cycle, peppered with loss. That relentless ‘on your knees and picked clean to the bone’ kind of Inanna-Persephone Initiation cycle. It was also really rich, with treasure too, but very much the via negativa path — an ’emptying’ cycle whose aim is to uncover what’s true and authentic, because it sure does get covered up and paved over! A real blessing this past 15 months or so is that that degree and velocity of loss calmed itself over this past year and a half, allowing the dust to settle a bit. So this past year-plus, in that field of smoldering wreckage that had been ‘life as I’d known it’, I noticed fresh, green shoots emerging from the ashes and compost — a new greening, as I’ve called it before. Very phoenix, right? From late 2013 and through 2014, I noticed a sense of actual progress building. That’s pretty woo-hoo-hoot-worthy. There is also a new receptivity that can come when we’ve been emptied out of all that clinging and striving, but oof! I wouldn’t wish that level of deconstruction on anyone! Also, getting scrubbed clean of some seriously unhealthy conditioning — those things we come to believe early on are normal but they’re a toxic normal, including in family dynamics. Having those particular rose-colored-glasses shattered can feel brutal, but what starts growing out of it is a sort of clarity and liberation. Very Uranian-Pluto! Linda: Did you receive any “gifts” in terms of powers or skills? Hmmm. I guess I’d say the answer to this is in the above, but they all add up to a very Saturnine gravitas and resilience that come out of persistent initiation experiences, and that really does feel like a gift, albeit a costly one. Saturn is surely a Master Magi teacher and gatekeeper for Wisdom, Sophia. I can’t say that I’m there yet, but I’ve felt an incoming tide of that gravitas … a hint or sense of real foundation that isn’t rooted on externals which can, and often do, shift in a moment’s notice. That’ll be continued learning and practice, too. Many thanks for the invitation to share these blessings and lessons and gifts from this past year, Linda at LiteBeing! To read the previous Blog Challenge 2014 Reflections post, head to Pearl Girl’s blog. For the next one, follow Glorialana’s musings. For the whole fabulous roster of shared musings (from wonderful people keeping inspiring blogs), head to Linda’s LiteBeing blog. For the scoop on the Queen of Disks and to see why I chose that image to start this post, see the Sophia’s Children archive post, When My Life Came to a Standstill. And to all of you, a magical, joy-filled Season of Lights and Christmastide, and a blessing-full year ahead. Thank you Jamie for a splendid offering and joining my tribe this year. Seems like we may be about the same chronos age, hehe, guessing from some similar astro cycles. We also share a major Saturn emphasis. You described the energies with insight and flair. I also would not wish the challenges of my year on anyone ( the losses especially), but understand that all is necessary by virtue of its appearance in our lives. I really enjoy your creativity and wisdom as well as the kinship of another Gem moon sibling! WP seems to be brimming with our kind and for that I am grateful. My Ascendant Uranus and Scorpio planets ( kindasorta TSquare) got trampled by Saturn. As you know, when an involved configuration gets activated, it is much more intense than Saturn conjunct , squaring or opposing a personal planet( which can be plenty in itself) I have both Saturn and Jupiter in Cap( almost conjunct) Saturn sextiles all my Scorp stuff ( Neptune Sun Merc ) and opposes Mars in Cancer.It also trines Pluto and occupies my 11th house. 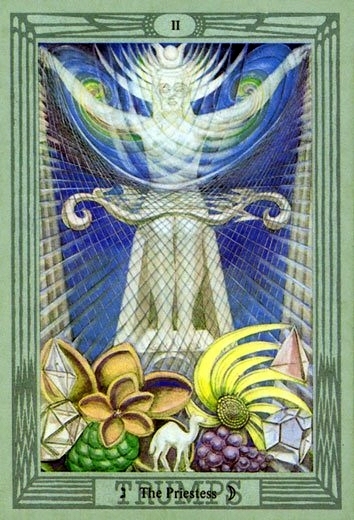 It is the ancient ruler of my Chart as I have Aquarius rising. Sometimes I like to pretend it does not rule my chart. I prefer modern ruler Uranus! love talking astrology with you and happy you were one of the blessings for me for 2014. This was beautiful. I’ve decided to journal these questions too as I close out the year. Happy New Year and blessings to you. beautiful and vulnerable sharing..thank you for expressing your journey so openly and with such grace. i was reading through some of the comments and saw you mentioning capricorn south node…and i have capricorn north node…another counterpart reflection. i also loved that you shared about your anam cara….an expression not many use, but is dear to me, and actually tattooed on my arm in connection to mine that is beyond the earth plane now. much love to you! yes, you hit the nail on the head…it is dr. emoto’s work that supported and influenced the work i do as a sacred tattoo designer…that what we wear on our skin/bodies will have a vibrational effect/shift on the water body we mostly are made of. ❤ and hugs! “Saturn is surely a Master Magi teacher and gatekeeper for Wisdom, Sophia.” YES! Amen. Sounds like another Saturn Sibling’s (or Saturn student!) comment. 🙂 And yes, it’s something I’ve been reflecting on for a couple of years now … that it seems that Saturn is the gatekeeper, the master teacher, for Wisdom, Sophia. To get to Sophia, you go through Saturn. Still musing on it, though, but it makes sense from my own experience. How about yours? Then I get to my actual school work, if I’m lucky. I’m with you on that! 🙂 See you! 🙂 Thanks for sharing your own Reflections on 2014, FiestaEstrella!